Can We Talk About Barn Bathrooms? It was my first day at a new barn with a perfect indoor arena! Before lessons began, I asked the owner where the bathroom was. She pointed to a roll of tissue on the tack room wall and told me to use any stall. I picked the one with the sleepiest looking gelding. I think he had visitors like me before. Disclaimer: I grew up on a farm. We got indoor plumbing around the time I started school. I think we can all agree that indoor plumbing, especially if you live next to Canada, is a great idea. It should also be obvious that work on a farm was rarely stopped to travel some distance to use an outhouse. Enough said. In the dark ages, not all horse show venues (a fancy name for someone’s barn) had bathrooms. Opting for some shred of dignity, most women would quietly slip off to their horse trailer/restroom. Historically it was considered good sport for men to tip toe to form a half circle, and applaud loudly as she stepped out of her trailer. It was either hysterically funny or psychologically damaging, depending on your ride that day or current state of mental health. Small barns like mine have a dilemma. A rental porta-potty costs more than you imagine. Still, I have been caught in the shower by a boarder coming in to use the bathroom more than once. From the other side, riders might feel a bit intimidated to use the house bathroom after opening the front door and facing the gauntlet of 4 dogs and a napping Dude Rancher. But that doesn’t mean that an outhouse is anyone’s first choice. What to do?? After all, not everyone was privy to the superior toilet training I got when I was young. 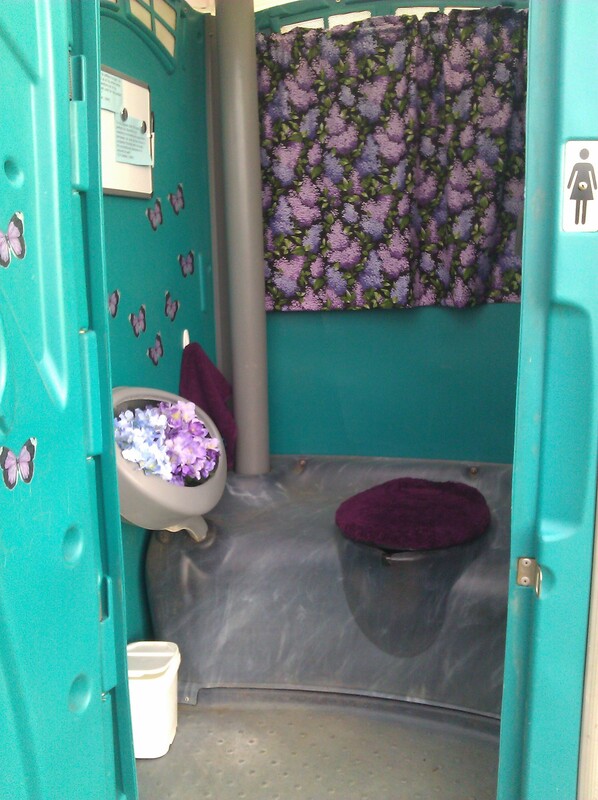 I am thrilled to say that this week Infinity Farm got its very own used porta-potty! I drove to an industrial park north of Denver and found a tightly corralled herd of porta-potties. I paid my money and they loaded me up. I smiled wildly- with a reclining porta-potty strapped down in my truck bed. Once I got home, I gave the green box a closer inspection. There were words- you know the kind- scratched into the plastic. I will be honest here, I use less-than-poetic words sometimes- but only on humans who deserve them. I would never allow that sort of language around horses. This is how it happens: weirdness comes on one step at a time. You don’t really plan ahead, instead it kind of unfolds. Running a barn calls for a wide ranging skill set. 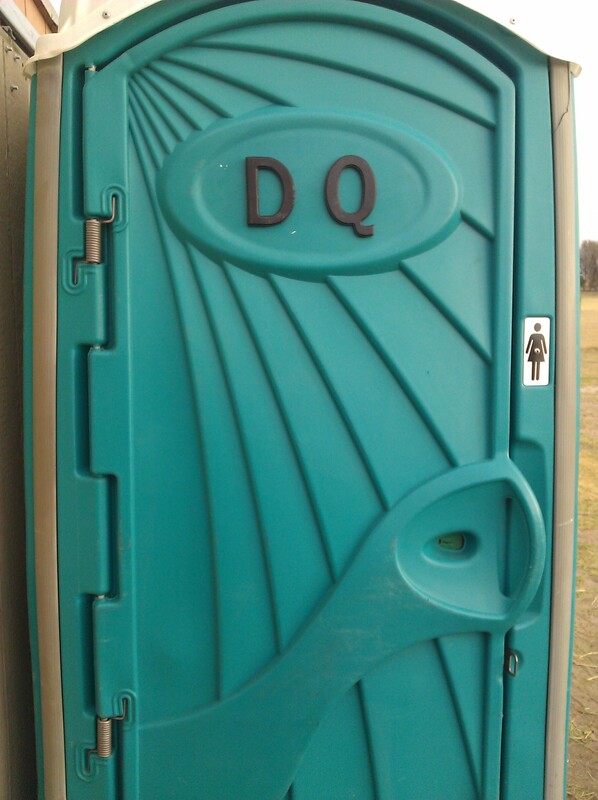 That’s how I found myself thinking about porta-potty decor. And how to encourage folks to not see the scratched profanity, but feel passively okay about using a defaced porta-potty next to a barn. That’s how curtains happen… and I can’t remember the last time I bought a plush toilet seat cover. Since there was such a wildly tepid response to my beauty tips, (read), I am going to plow ahead with my tips for interior decorating. Outhouses. 1. Curtains add a false dimension- 14.2 can pass for 16 hands. 2. Decals create a no graffiti look and oh, so upscale! 3. Nothing says spring (and sit to pee) like fake flowers. Warning: Interior decorating is extremely dangerous, especially compared to horse training. I got three paper cuts in just an hour- I am totally disabled. Anna, Infinity Farm, with an outhouse. Ah, the courage to admit the public challenge!! The porta potty is always available to you! Thanks Anna! I have family and friends in the west so ya just never know!